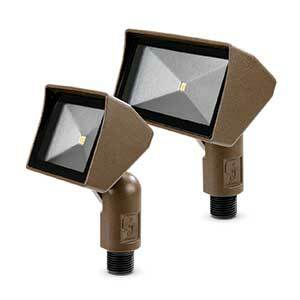 Vista Professional Outdoor Lighting added two new models to its line of Up & Accent fixtures. The Mini Floodlight Series items feature a slim, compact design that provides a higher output and more lumens per watt than standard LEDs, the manufacturer says. The two dimmable Mini Floodlight models—the 5105 and 5106—feature the latest Chip-On-Board (COB) LED technology. A single LED chip/emitter is available in 2-watt, 3-watt or 4-watt. Light quality is further enhanced by a high-performance anodized aluminum reflector. Color temperatures range from 3000 degrees K (W-Warm) 4000 degrees K (N-Neutral) to 5000 degrees K (C-Cool), and light output is up to 400 delivered lumens. A bordered, high-impact tempered lens offers both an attractive appearance and enhanced durability, the company said. Both models feature the same compact design with various available mounting options, including an injection-molded, glass-reinforced Ryton R-4 composite adjustable knuckle with 1/2-inch NPT. The fixture can also be mounted into threaded hubs in junction boxes, on ground stakes, in tree-mount boxes or on mounting canopies. Additionally, 16 standard polyester powder-coat finishes are available. The 5105 Mini Floodlight model is the smaller of the two, with the fixture itself measuring 3 1/4 inches wide, 1 7/8 inches high and 2 inch deep. The 5106 measures 5 inches wide, 2 1/2 inches high and 2 inches deep. When mounted using the Ryton adjustable knuckle, the fixture’s height increases to 2 1/2 inches high for the 5105 and 3 7/8 inches high for the 5106.